Buy Taifun Organic Vegan Smoked Tofu with Almonds & Sesame Seeds - 200g in the UK from our online shop or directly from our independent Scottish store. This version of Smoked Tofu gets its hearty-crispy taste from the roasted almonds and sesame seeds. Can be eaten hot or cold. This version of Smoked Tofu gets its hearty-crispy taste from the roasted almonds and sesame seeds. Enjoy it cold on bread, in a salad or pan-fried with vegetable dishes, pasta or rice – the "Almonds & Sesame Seeds" give each dish a savoury flavour. Eat hot or cold. A delicious classic seasonal recipe with a twist. By using tofu of choice instead of real meat, this vegetarian recipe is a treat for everyone. This recipe contains 2 x Taifun Smoked Tofu + Almonds. Where can you buy real Taifun Smoked + Almonds Tofu safely online? If you are wondering where you can buy Taifun Organic Vegan Smoked Tofu with Almonds & Sesame Seeds - 200g safely online in the UK, then shop with us. 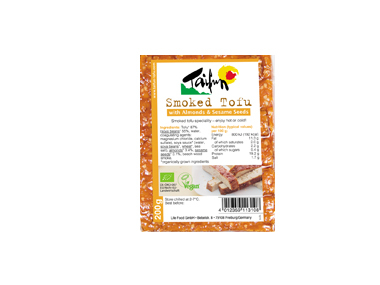 Taifun Smoked + Almonds Tofu - Taifun Organic Vegan Smoked Tofu with Almonds & Sesame Seeds - 200g in Meat Replacements and Chilled Foods.